On a Support Plan? We can help! With the release of version 5.08 build 318, Remote VirtualBoss installation has been greatly simplified! Please jump to this section to see a revised Installation Guide. In order to run Remote VirtualBoss, you'll need to install a copy of PC VirtualBoss to your computer. If you have not already done so, download VirtualBoss to your computer and follow the installation instructions. It's important to note that Remote VirtualBoss is only available in versions 4.0 and up. If you're using an earlier Version, a free update is available! 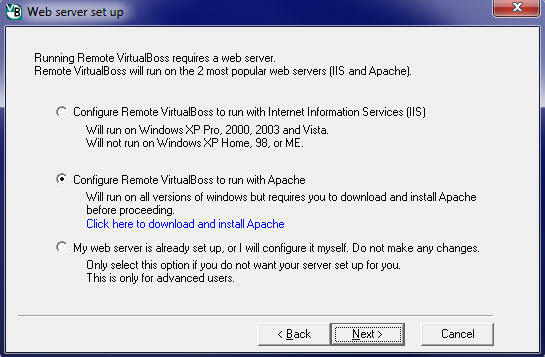 Remote VirtualBoss requires the use of a web server software in order to run on your computer. The web server software will allow you run a website on your computer. The choice is up to you, though we find Apache easier to use and recommend it. Click a choice below for setup instructions. Windows has a built in Web Server software called Internet Information Services (commonly referred to as IIS). As a Windows user, IIS may already be installed by default on your computer. Although, it is not uncommon for this service to not be turned on or installed by default with your computer. To see if IIS is installed, go to the Control Panel of your computer and click on Administrative tools. If you see Internet Information Services there, it's already installed and you're ready for Step #3. If you do not see it here, you'll need to install it. You can typically do this by clicking Start, and choosing Computer. From here, click on Uninstall or Change Program. Then click on Turn Windows Features on or off. In our opinion, Apache is a bit easier to manage than IIS. If you don't have IIS installed, you may consider Apache as your web server of choice. You will need to download a special version of Apache to work with Remote VirtualBoss. Click here to download Apache web server from our website. for All Users, on Port 80, as a service -- Recommended. only for the Current User, on Port 8080, when started Manually. After this step, Apache should finish configuring itself and open a web page showing you the "Localhost", or default website on your computer. Now we're ready for Step #3. Please see our Apache Troubleshooting section for common issues and ways to resolve them. 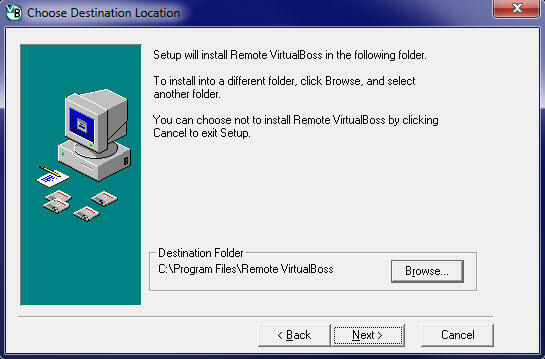 Now that we have VirtualBoss and a Web Server Software installed, it's time to install Remote VirtualBoss. To begin the installation of Remote VirtualBoss, go to Options → Remote VirtualBoss. With version 5.08 build 318 and higher, Remote VirtualBoss is automatically installed along with VirtualBoss. We've also included Apache 2.2 already pre-configured to work with Remote VirtualBoss so there is no need to download and configure additional software! Once you have VirtualBoss installed, you will already have Remote VirtualBoss installed as well. 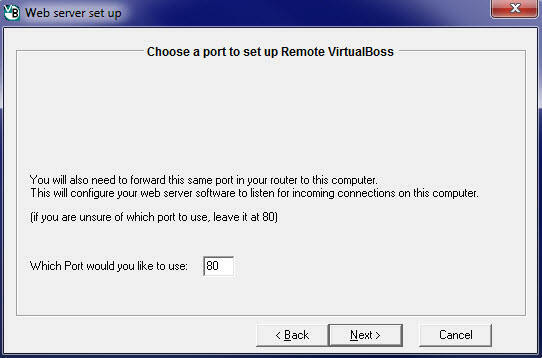 In order to use Remote VirtualBoss, you will still need to configure your router. By this step, you should be able to view your Remote VirtualBoss website by going to your Localhost. You may notice that your website is running, but it is only available to users on your local network. But we want to make this website available to users from anywhere. To do this, you'll need a few things. Find your router on this page by looking up its name and model #. Follow the "default port-forwarding guide" for your router to set up a simple port forward to you computer. After you've set up your port forward rule, you can test to see if it's working with this easy to use Port Checking Tool. Now that your website is set up and your router configured, you'll want to start accessing your website remotely. Your website works like any other website on the internet. The only difference is that you are in control of it! Your computer is running the website so it's important to remember that if your computer is turned off, the website is not available. You may also want to consider using a DNS update client to make it easier to remember your website address. There are many free services that you can use. No-IP is one we recommend. If you get stuck and are on a Support Plan with us, we can help!